This inspiration photo perfectly captures the mood I want my cottage garden to have. . .Charming. . .Romantic. . .And oh so inviting. This post contains affiliate links. See my disclosure for more information. Abundant flowers, cozy seating, odds and ends and oodles of pretty things to gaze upon. And this is where I want my perfection to reside. Not much to look at right now, is it? Oh, but I know it will be wonderful some day, and I'm patient enough to see it to fruition, God willing. Meanwhile, I've been looking at outdoor seating. Because a girl should be able to sit and watch her garden grow around her, right? There are so many options. 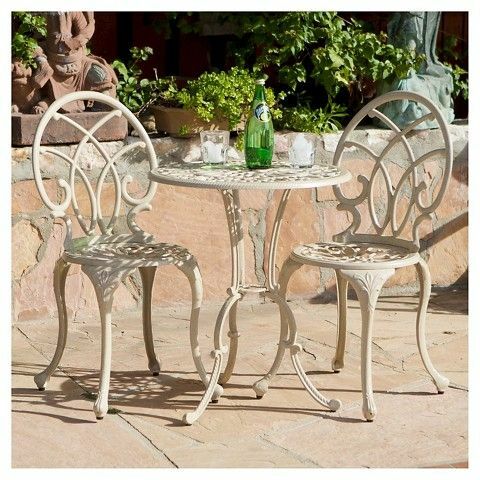 Take bistro sets for example, they're nice for intimate conversation or dining. This Christopher Knight Home set has an old world flavor. For something shabby chic I love this Astorial Bistro Table from Dot and Bo. 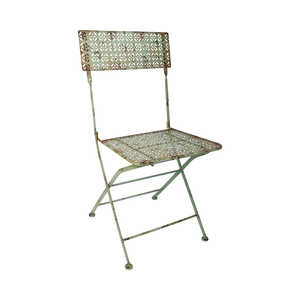 Paired with Esplanade Folding Chairs for that time-worn look. My inspiration photo features a daybed, but my available outdoor space and location says "probably not." I think a bench would work equally well. Just add cushions and pillows to make it super comfy. 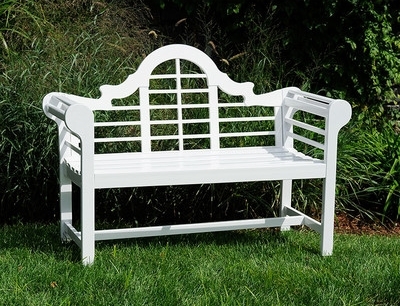 Start with a great-looking bench like this Lutyens Wood Garden Bench. 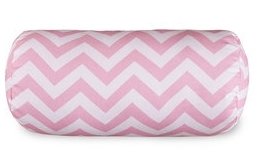 Throw in some pillows (no pun intended). 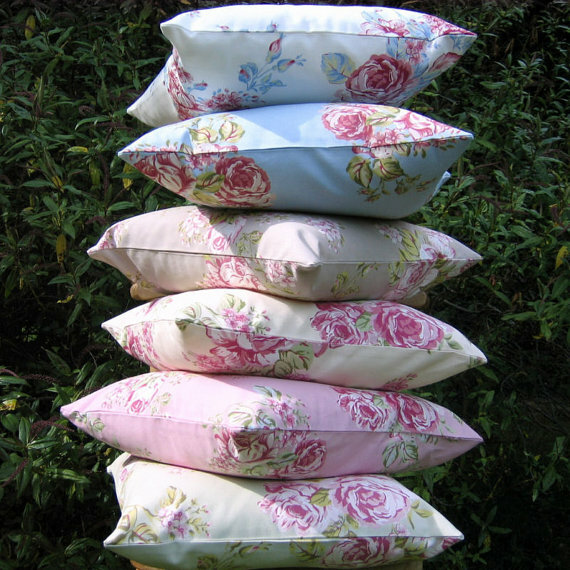 These cushion covers are cottage garden pretty. Round bolsters for the ends. Hmm, I think it's working. And then there's always the option of a swing with a canopy. I'd like to find one like this. . . I could just see myself here, lemonade in hand, swinging my way through summer. I think I might even let Dennis join me. What's your idea of the perfect garden? 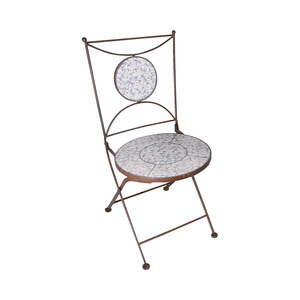 Beautifully furniture and accessories for the garden. I totally agree with you. I am not doing much to this yard right now. We plan on selling in about five years, but the next house I want a romantic and charming garden too. we've got the same tastes, be sure, thank you for sharing such an inspiring post ! The bench or the swing fit my style. The chairs are cute, but don't look too comfortable for reading and relaxing. I could easily see myself on the bench or in the swing reading, dreaming, knitting, or even napping. I have been working outside a lot this week. I just added a birdbath to my garden. I have never had a birdbath before. I found a blue pottery one. I just love how it looks. pillows. I would like a water feature, it's so soothing. Looking forward to seeing your Romantic Garden reveal . They are all gorgeous! Can't wait to see yours finished. I know it will be beautiful. My vote is the swing set, with the canopy. I had one and it was where you'd find me. Sometimes alone or with some ❤️. I LOVE the top picture but I could also see myself in the bottom swing. Adjustable overhead to keep the sun just right and sitting with only my big toe rocking me back and forth. Hum.. wonder if I have a place for one! Love your garden ideas Nancy. I cannot wait to get my garden going too. Love the pretty white bench I can see lovely cottage pillows on that. The comfy day bed for taking a nap looks so inviting too. Beautiful ideas. Well Nancy, I think you pretty much covered yours AND MY ideas for a perfect garden! I believe we belong in the garden, it's in our DNA. God created us there and there is still a part of us that yearns to be right in the thick of it. 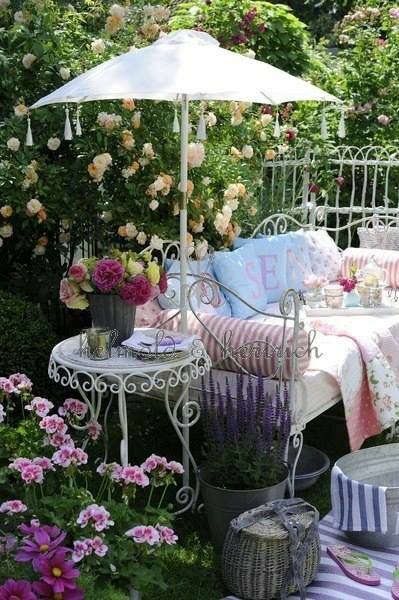 So, what better way than to sit and contemplate on a pretty chair, a daybed or swing! Last year, we completed a new concrete walkway and bistro area out in the front of the house. Now we have yet another space to sit (on a darling old black bistro set) and enjoy the front garden of boxwood and evergreens. About2 years ago, we had our deck covered and that is where I have a vintage daybed, a wicker settee and two vintage white chairs. 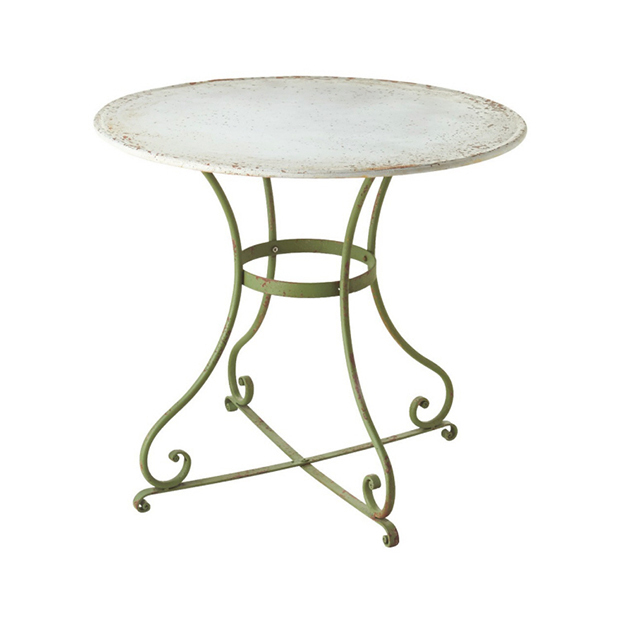 I just need a little bistro table to cover with a white tablecloth. I hang wispy curtains in the summer and I'm ready to look out the screened portals at nature go by. An ideal thing (be we no longer have the room) would be to have a little tea house! I'd fix that up entirely up in WHITE and that is where I'd spend my time reading and writing.OH! YOU GOT ME DREAMIN'! Great ideas and you will find what works best for you in your new gardens. I have a porch swing and it is the family's favorite place to sit. We all squeeze on it together and swing. Those moments are the best part of summer! 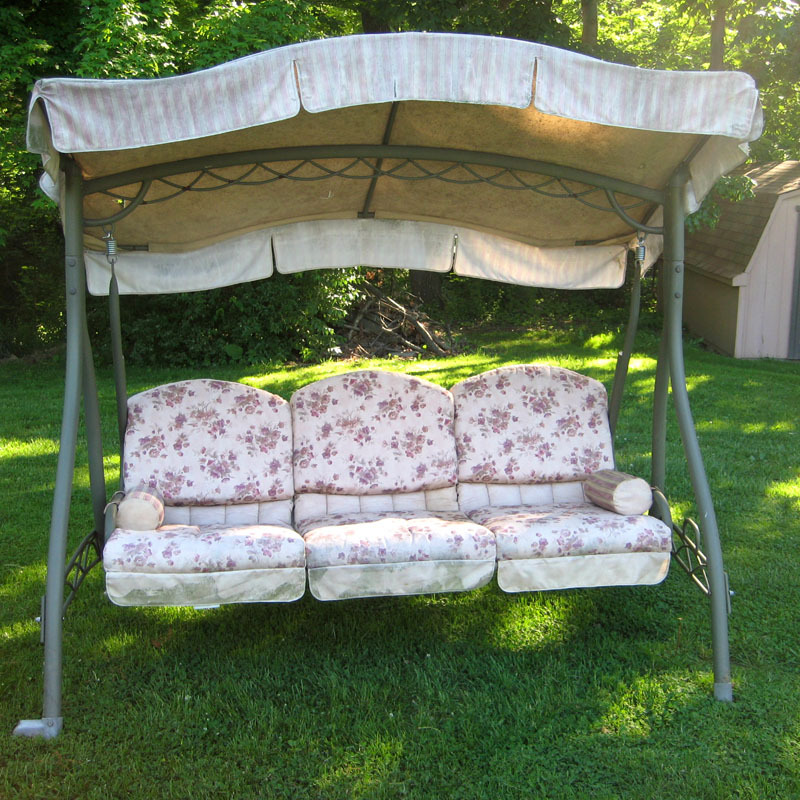 I would have to go with the swing with awning as I love rocking and swinging on the porch. Unfortunately my screened room faces west and it is unbearable out there in the afternoon. If I ever move I will be sure to find a house that faces north or south. I need to change my garden chairs & table, and I found your post really inspiring. Good Afternoon Nancy, I see your vision and it is a beautiful vision for your garden. I love romantic, overgrown gardens filled with cottage garden flowers and lots of climbing roses. I love a garden which evolves and how marvellous that you can create your personal style from scratch. Often we inherit gardens which we have to change over time. I am really looking forward to seeing the end result. I have white adirondack chairs on my patio--I love them! As for my garden, I want a combo flower, herb and vegetable garden. You got great ideas flowing! I can hardly wait to see what you will create on your outdoors space! The colors are romantic, beautiful and great for Summer. Sorry that I did not had time lately to visit all the lovely blogs that I usually visit. I got a new job so it's a bit hard now. Happy Mother's Day!! I love that very first photo as well. A place to relax, read, entertain, have tea, it looks heavenly to me. And I like the lavender pot, it is said to keep mosquitoes away.